Total Built-Up Area - 1,322 Sq.ft. 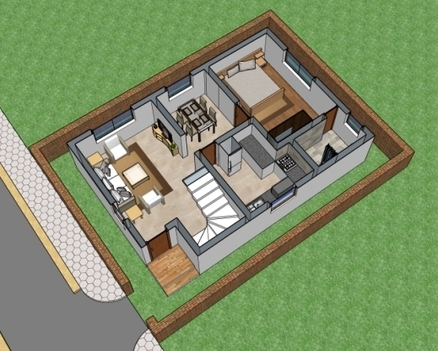 This is a a very compact house floor plan which can easily fit onto a plot of size 30 x 40 ft. This Ground + 1 Floor high floor plans includes a large Living room along with a small dining space next to it. The ground floor also manages to nestle one bedroom along with an attached bathroom. The proximity between the living, dining and the kitchen manages to balance the overall design of the house. The upper floor manages to include a study room which is more like a common passage space, between the two bedrooms on first floor. Only one of the bedroom gets an attached bathroom which is kind of appropriate for most family needs. The size of this small house plan is well to fit for quite a good number of plot sizes available in India. Do let us know if you like the plan but need few changes as per your plot size. 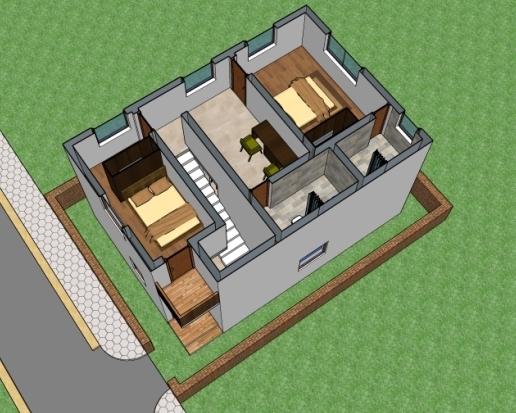 We will be able to make modification to this house floor plan.